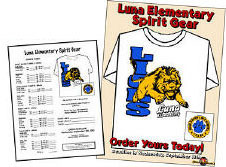 Poster request form at Gilbert-American :: School Shirts and Uniforms, Custom T-shirts. This Form is for ordering your Master Order Form & Poster Request. Your Artwork must be approved prior to making your request. You will need a valid Style Number for the approved Artwork. Please DO NOT use this form unless you have already approved your Artwork and have a valid artwork Style Number. Please complete this form so that we can better serve you. We will use this information to contact you when your request is completed. We do the Artwork for You! No complicated and limited online design studios you have to figure out. Your Artwork Proof will be created by a Real Live Graphic Artist to give you superior results and less frustration.